The first production P-80As were painted to smooth all skin joints. Painting was later discontinued. Few airplanes in the history of aeronautics have been as successful as the Lockheed P-80 Shooting Star. It was the first American combat-ready jet fighter when it went into service in 1945. It emerged as victor in the world's first all-jet combat, and it won the distinction of remaining in production for a full 15 years after the first experimental model was flown. The airplane had its origin in June 1943, when Lockheed was requested to design a fighter around the De Havilland built Halford H.1B turbojet engine, developed in England, in response to Germany's Messerschmitt Me 262 jet fighter.1 The XP-80 was designed and built in the amazing period of only 143 days—37 days less than the original schedule. This was no mean feat considering that this was not a mere research aircraft, but a production prototype complete with armament. It was housed in a temporary building in complete secrecy, which was the beginning of the famous Lockheed 'Skunk Works.' The inaugural flight was on January 8, 1944, and a total of 1,715 aircraft were built. The XP-80 was an all-metal straight low-wing aircraft of conventional design and had a tricycle landng gear. The cockpit was unpressurized and had an aft-sliding bubble top canopy. It had an internal fuel capacity of 200 to 285 gallons (757 to 1,079 liters) in two wing tanks and one self-sealing fuselage tank. Armament consisted of six .50 caliber machine guns in the nose with 200 rpg. The F-80C was the fastest version, with a speed of 580. It had a larger engine than the earlier models. The United States Army Air Force (USAAF) planned to build the Shooting Star in large numbers. However, only two aircraft arrived in Italy before the end of the war in Europe and these were never used in operations. Despite the cessation of hostilities, production was continued on a reduced scale. Lockheed built a total of 917 F-80As and Bs. One aircraft was modified for an attempt on the world speed record and on June 19, 1947 and set a speed record of 624 mph (1,004 km/h). Some of these modifications were retained in the F-80C and a total of 798 F-80Cs were produced between 1948 and 1949. 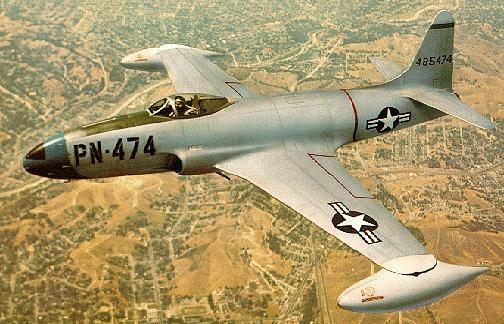 At the same time, Lockheed designed a two-seat version, the F-94 Starfire. This model was equipped with radar for all-weather operations. When war started in Korea, F-80's were sent to the battle area to help the South Koreans. On November 10, 1950, Lieutenant Russell Brown, flying a Shooting Star, made history when he destroyed a Russian MiG-15 fighter in the world's first decisive all-jet combat. However, when compared to the Mig, the F-80 was outclassed and it was quickly replaced by the North American F-86 Sabre. The final version of the plane was the T-33 trainer, which remained in continuous production until August 1959. The F-80 was a very hot airplane to handle, compared to slower piston engine aircraft and an alarming number of airplanes were lost. The solution was the redesigned T-33A two-seat trainer. The F-80 was a very hot fighter, and a number of airplanes were lost. The solution was a redesigned T-33A two seat trainer. In the early years, some T-33s were blowing up just after takeoff. Just aft of the cockpit, there was a filler cap covered by a Zeus fastened cover plate for the fuselage fuel tank. Some pilots and ground crews were not diligent in checking the cover or the cap. After takeoff at about 120 knots, the airflow would create a vacuum over the fuel cap. If the cover and cap were not properly closed, jet fuel would be sucked out of the tank into a spring-loaded plenum chamber, behind the fuel cap. The plenum chamber doors feed extra air to the engine until the aircraft reached about 200 knots. The combustible mixture would ignite and cause the plan to explode. The problem was solved by placing two fins underneath the cover which had to mesh with the fin on the cap. The cover could not be locked if the cap wasn't secured. After hearing the horror story once, pilots would always check the cover and its Zeus fastener. 4,580 ft (1,396 m) in 1 minute. Allison J33-A-9 with 3,850 lb S.T. (1,746 kg). or ten .5 inch rockets. 1. Rene J. Francillon, Lockheed Aircraft Snce 1913. Annapolis, Maryland: Naval Institute Press, 1987. 236. Created June 3, 2002. Updated October 28, 2013.